This craft is a Rear Loading and Off Loading Dropship Personnel Carrier with 2 Crew Members, 10 Passengers, on two decks, light on fuel but fun to operate. MK1 Modules are provided for those who would like to transport crews around the KCS. Note: Use at least one pilot to control the craft the remote control will not give correct control, most all of our Dropships and VTOL crafts are designed this way. Flight Operations: Engage RCS and SAS, throttle up to full then press spacebar for the Lift Engines to engage and a second time for the Port & Starboard Engines to engage after leaving ground level. Landing instructions are in the Video if needed. 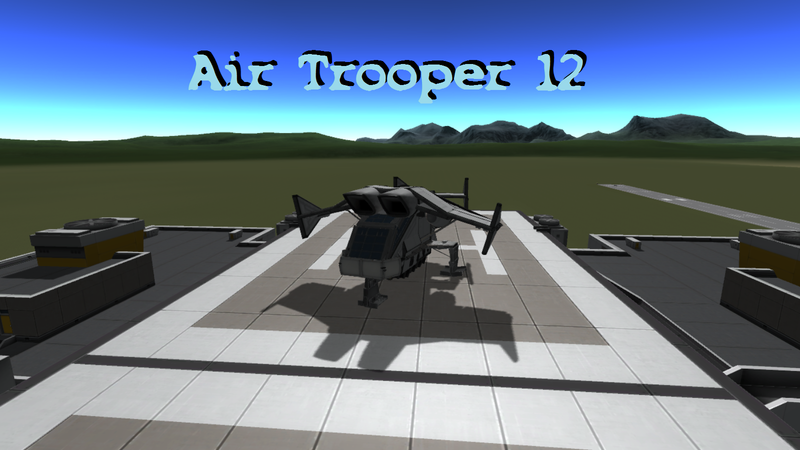 A stock aircraft called Air Trooper 12. Built with 400 of the finest parts, its root part is probeCoreOcto2.